Just days before the bidding was closed at the auction of Cone Mills, we said farewell to the old mill in Cliffside. It had been shut down for good the previous month. 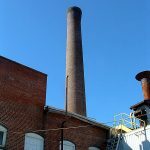 On January 28, 2003 Buzz Biggerstaff, Sam Davis, Charles “Red” Humphries, Frank Holtzclaw, Roland Wallace, Betty Bailey and I joined up to tour the old mill, taking these 43 photos along the way. We spent the better part of that afternoon marveling at the changes that have been made since most of us worked there years ago. It’s sad to think that, most likely, no one will ever work here again. In addition to the pictures, we’ve written an article about the tour called “One Last Time Through the Mill.” It’s in the History, Articles Section.